Synth guru Ross Kelly investigates the widely popular Prophet-5 synthesizer by Sequential Circuits in this spotlight series exploring the vintage gear that has had historical influences on music. In 1978 the synthesizer company Sequential Circuits founded by legendary instrument engineer, Dave Smith introduced the very successful Prophet-5 polyphonic synthesizer at the Winter NAMM show and opened the doors to a new age of synthesizer technology. The Prophet-5 was the first synthesizer to feature full digital patch memory and five full voices of polyphony. 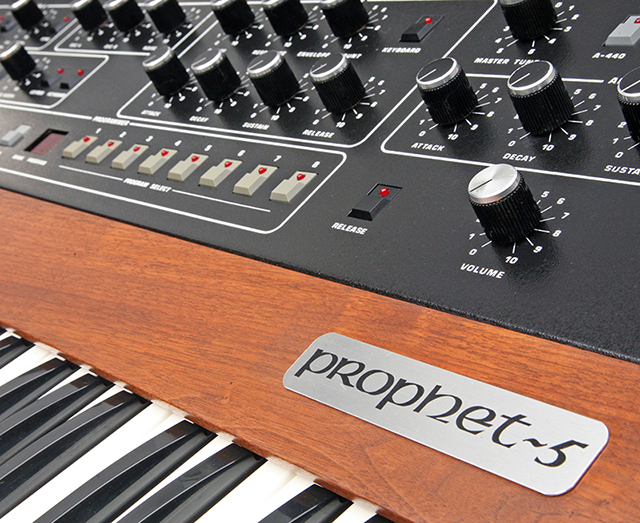 This leap in synth engineering has made the Prophet one of the most imitated and sought after synthesizers in history. Prior to the introduction of the Prophet-5, most polyphonic keyboards were string synthesizers that used octave-dividing organ technology to create polyphonic sounds. In contrast, the Prophet-5 featured five individual synthesizer voices comprised of two voltage controlled oscillators (VCO), a white noise generator, and a low pass filter (VCF). Both the VCOS and VCF are modified by two separate four stage voltage controlled envelope generators and an analog LFO. The polyphonic modulation (POLY MOD) section of the synth allows OSC B and the filter envelope to be used as modulation sources that can control either OSC A’s frequency and pulse width or the filter frequency. OSC B can also function as both an Oscillator or an LFO as well. The POLY MOD section allows for amazing sweeping effects, wild noises, and various frequency modulation type sounds that famously attribute to Prophet’s signature sound. During its manufacturing life from 1978 through 1984, the Prophet-5 went through three major revisions that added or changed features and improved reliability. The first revision, known as ‘Rev 1′ was the original prototype built in Dave Smith’s garage. Very few are still in existence and/or working. The first manufactured version ‘Rev 2′ varies little from the original in use, features, and sound quality. The third and most common revision, however, brought some major changes in features and function. One of the most significant changes was the Synthesizer IC chips used to creates multiple voices was upgraded from the original SSM brand chips to CEM chips. This change was mostly done to improve reliability, as the SSM chips were known to be extremely unreliable. The general consensus is that the SSM chip revisions have a grittier and more musical sound, which may be due to the fluctuations that made them unreliable. Also, ‘Rev 1′ and ‘Rev 2′ were not MIDI capable unless it was added with a factory retrofit or some 3rd party kits from companies like Kenton. MIDI functionality was later introduced on ‘Rev 3′ which was another significant improvement. Further important changes were made to improve the way the patch memory functioned. In the first two revisions, there were preset buttons in the Modulation and Filter sections that had to be pressed to edit the preset settings. These buttons also functioned as controls for the Cassette backup functions. The ‘Rev 3′ units ditched the preset buttons for knobs that allow you to edit the preset, which is how most modern synths function. Upon its release, the Prophet-5 was most sought after synthesizer to have at the time. At the original $4995 retail price, it was still considered to be the first affordable polyphonic synthesizer with full patch memory. The classic sound of the Prophet-5 can be heard in numerous hits of the time and still used today. Throughout the years, the Prophet-5 has continued to be a legacy instrument that has spawned a host of imitators, emulators, and virtual instrument re-creations. Yamaha, who became the owners of the Sequential Circuits brand in 1987 due to financial issues, based their AN1x Virtual Analog synthesizer on the Prophet-5′s technology, which Yamaha still currently owns. Nord’s famous ‘Lead’ line of synths are also loosely based on the architecture of the Prophet and even include a factory bank of sounds that are made to emulate the original presets of the Prophet. Dave Smith has even released a continuation of the Prophet legacy with the Prophet-6, Prophet-8 and Prophet-12 developed by his new company, Dave Smith Instruments. There have also been some software-based synths that emulate the Prophet-5 such as Arturia’s ‘Prophet V’ and Creamware’s ‘Pro-12′ which was later turned into a hardware emulator called ‘Pro-12 ASB.’ Native Instruments has also released a software synth called ‘Pro-52/53′ which was discontinued in 2009. As one of the most revolutionary instruments of its time, the Prophet-5 became an inspiring force for many artists throughout the years such as Kraftwerk, Carl Craig, Tom Tom Club, Bernie Worrell, Gary Newman, Ozzy Osbourne, Pink Floyd, Vince Clarke, Tears For Fears, Berlin, Eurythmics, Joy Division. Dr. Dre, The Prodigy, Kitaro, Yellow Magic Orchestra, Public Image Limited, Derrick May, Ryuichi Sakamoto, Tangerine Dream, Jeff Mills, Duran Duran, Pet Shop Boys, Depeche Mode, New Order, John Carpenter, The Cars, Vangelis, Patrick Cowley, Sylvester, The Cars, Phil Collins, John Carpenter, Peter Gabriel, and several others. Below are a few popular songs that features classic Prophet-5 sounds. The Cars hit song “Let’s Go” features multiple Prophet-5 preset sounds including the ’32 Sync II’ factory patch – one of the quintessential Prophet lead sounds. The American New Wave band Talking Heads perform their chart-topping hit “Burning Down the House” live on stage at Hollywood’s Pantages Theater in 1983. On March 31st, 1983 Gillian Gilbert of New Order is shown playing both pads and sync lead on the Prophet-5 while performing their legendary single “Blue Monday” on Top Of The Pops. James “D-Train” Williams and Hubert Eaves III feature the Prophet-5 heavily in most of their hits. In this recording on Midstad TV in 1983, D-Train is shown performing “You’re the One for Me” using the Prophet-5.